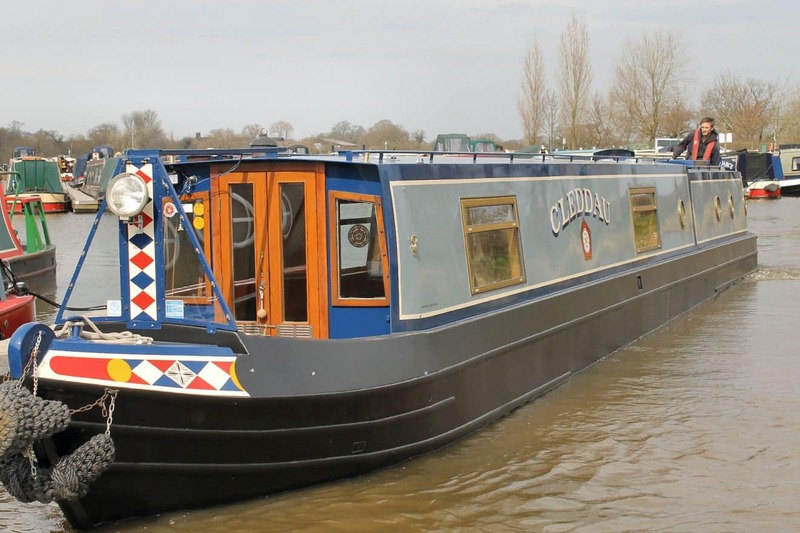 “Tomorrow a half day’s cruise to Pershore” were the words that finished yesterday’s blog. Never assume reality will exactly mirror the plan. Eager to be boating this morning (“only to Pershore, get there early, get a good mooring”) the Captain galloped into Tewkesbury to acquire essential supplies and then cast off, sans breakfast, (“because we’ll stop at Tewkesbury Marina for fuel and sanitary station”). The fuel was over-priced, the sanitary station the wrong sort so on Cleddau cruised – in the first of many short sharp showers of the day. On we cruised, past Tewkesbury’s outskirts, past the picturesque pub at Twyning and under the M5. At the first of several sailing clubs youngsters were waiting to cast off from the bank, high visibility striped sails flapping above their heads. Swallows and Amazons, 2011 style. On we cruised, Bredon, a huge quilted security blanket of a hill, beams down at the river for miles and miles as it twists and meanders along its course. Carpets of water lilies spread out from the banks, poppies danced in the fields and there was a glimpse of a WW2 pillbox. Anglers fish from small boats and both river banks but the river is wide enough for all to use. It was at Strensham, the first lock, that the first adventure, so to speak, occurred. The landing stage is awkwardly angled beside a weir. Boatwif was landed at the second attempt and thereafter the Captain struggled to hold the boat off, while slowly, oh so slowly, two white cruisers dropped down through the lock. Progress up the lock then occurred, shared with another narrow boat. At the top was the brand new sanitary facility – too difficult to access with now three boats jostling for the same space. No problem, no emergency, so on Cleddau cruised. Nafford Lock hove into view, with far easier access to a landing stage. But – a high landing stage, a rope, a lock handle – something has to go. It was the lock handle, down into the deep, unrecovered, despite best efforts later with the sea magnet. Up on the lock there were strange shapes: poles, boat hooks – and much consternation. The right hand top gate would not close; in the water below lay a hidden obstruction. Men with boat hooks pushed, prodded, fished. The Captain took his extra long boat hook to the scene, but no success. Search the engine room: a crowbar, wound round with rope, was converted into a grappling hook. The fishing continued. Arrived on the scene now were a dozen scouts, in a catamaran canoe, paddling with sleeping bags to Eckington for overnight camp. “This is fun!” pronounced a young spectator. Two other narrow boats arrived below, to be lashed against Cleddau. The operation continued. The scouts climbed out of their boat, settled on the lock side grass, and chewed their way through their lunches. The Captain with his grappling hook, attached to another boater’s magnet, continued to fish and drag, fish and drag. A walking group, plus dogs, arrived. No footbridge across the lock so , intrigued, they crept one by one across the lock gates. Forty observers now as the prodding and pushing continued. A truce was called: equipment inadequate. A volunteer from the Lower Avon Trust arrived on the scene, he with a bigger, better grappling hook. Obstacle cleared, gates closed, lock back in operation – until the next locking through. Now the scouts were in the lock, the gate not closing. Again the volunteer pushed and prodded, convinced that cill bricks were loosening and jamming the gates. At last it was Cleddau’s lock! Impatience was rife, tempers fraying, an irate foul-mouthed idiot trying to direct operations. Words were thrown. Some two hours after arrival an escape! Past the top weir, round a tight corner and back into the dreamy landscape. Then to Pershore and its two bridges. The river creeps and twists down from the lock. Here a slippery uneven landing stage, huge heavy gates, and an additional ground paddle set back from the top gates compound the difficulties. Thanks be to kind boaters who recognise that to help others is to aid their own progress. It was late afternoon when Cleddau moored up at Pershore’s neatly kept recreation ground. What impressions then of this hardly known place? “Riverside Georgian Town” states the town council notice board. It is quietly elegant, the streets florally enhanced. It has a fair selection of fashion, grocery, shoe, gift and book shops, but perhaps disproportionately for a town of its size, more pet shops and pet charity shops than you might expect. The Abbey was locked – but what a treat was the beech tree sculpture! A local road sign points out towards Upton-upon-Severn: my, we were there eight days ago…! Tomorrow to Evesham: theatre seats booked for Wednesday night in Stratford.